I like to read my daughter books each night before bedtime. 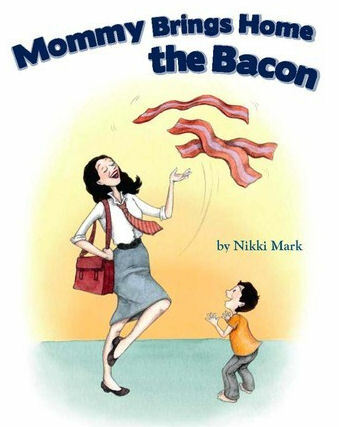 I thought this would be a good opportunity to check out the new book, Mommy Brings Home the Bacon by Nikki Mark. Mommy Brings Home the Bacon” is a heartwarming children’s book that explores the touching relationship between a young boy and his working mom. Told from the young boy’s perspective, the whimsical narrative reflects a child’s imaginative interpretation of why mommy goes to work, and the beautiful bond that develops as a result. Bringing simplicity and lightheartedness to an emotional topic, “Mommy Brings Home the Bacon” fosters a child’s appreciation for a working mother, while simultaneously easing the minds of moms who balance the difficult responsibilities of financially supporting their household and raising the children they so dearly love. Personally, I work three days a week, so while this book wasn’t as pertinent to our particular family dynamic, it was a good story. I liked that she used a commonly used term “bringing home the bacon” and how that was incorporated into the story. I can see some very common themes with children missing their parents while they are at work, I think that all parents and children can relate. It was a very cute story and I think would be applicable to most school age children. I am afraid that with the younger children, the concept of the bacon would get lost and therefore get in the way of the story. Also, there was a lot of white space, and it might not keep the attention of a younger child. The views and opinions expressed on this blog are purely that of the blog owner or writer. Any product claim, statistic, quote or other representation about a product or service should be verified with the manufacturer or provider. I received free product in order to facilitate this review. Jill is mommy to a 4 1/2 year old little diva, which is her favorite job. She is married to a wonderful husband. She works part-time, so she is always looking for things to make her life easier. She loves finding new adventures for her and her daughter. I thought about reading this book on my e-book. My kids wish I would go to work so daddy could stay home and play with them. The kids always miss the parent that goes to work.